Butternut squash is the surprise ingredient in this drink. Listen to Tammy and Lester as the drink is mixed. 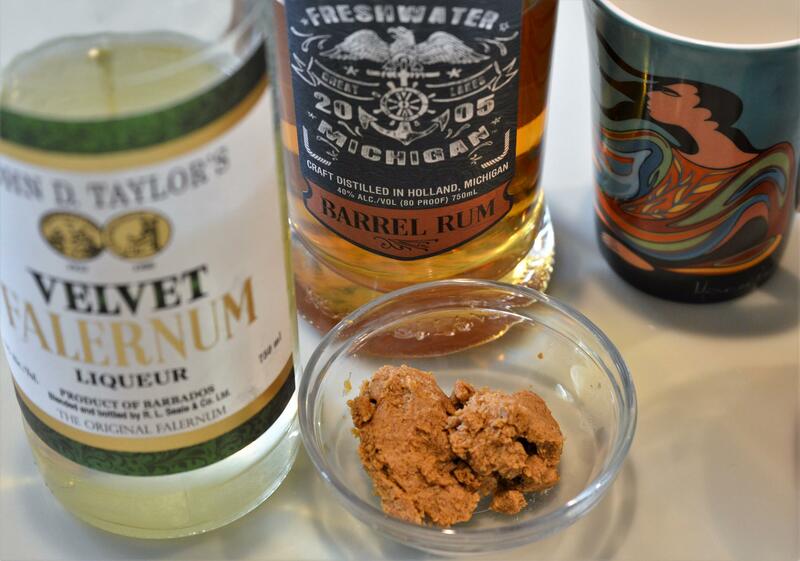 “One of the most popular drinks that I teach in my classes is hot buttered rum,” said Tammy Coxen with Tammy’s Tastings as she was putting the kettle on to boil. However, we are not making hot buttered rum. “I am a sucker for clever wordplay, so when I came across a recipe for hot butternut rum, I had to make it,” Tammy said. Like a hot toddy, it starts with a base of a hot liquid. “Sometimes that is hot water, but in this case it’s an Earl Grey tea,” Tammy said, adding that it brings another dimension of flavor to the drink. The Hot Butternut Rum starts with Earl Grey tea and a spiced butternut squash butter. The other ingredients, a spiced squash butter, the rum (we used New Holland’s Freshwater Barrel Rum), and Velvet Falernum all bring a lot of spice notes and flavors to this hot toddy. Back to the namesake for this drink: hot buttered rum. No one seems to know when someone added butter to a hot toddy or why they thought that would be a good idea. However, in Tammy’s research, she found in the 1939 Gun Club Drink Book by Charles Browne, the author explains the butter is only there to lubricate your mustache. We think the mustache is optional. Combine in food processor until well blended. Store refrigerated. Listen to Tammy and Lester discuss Rusted Crow's flavored whiskey and bitters from Black Ink Bitters. The copper mug was on the mixing table, but I knew Tammy Coxen with Tammy’s Tastings was probably not going to be mixing a Moscow mule. She was about to throw me a curve.